The TV network Starz is learning about the Streisand effect the hard way. 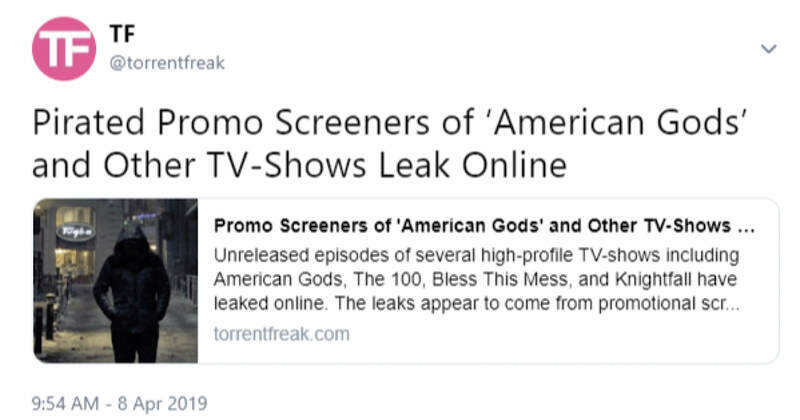 Earlier this week it used bogus copyright claims to take down a tweet from TorrentFreak which linked to its reporting on an unreleased Starz original TV show being leaked online. TorrentFreak responded by writing an article about Starz attempting to censor this tweet. 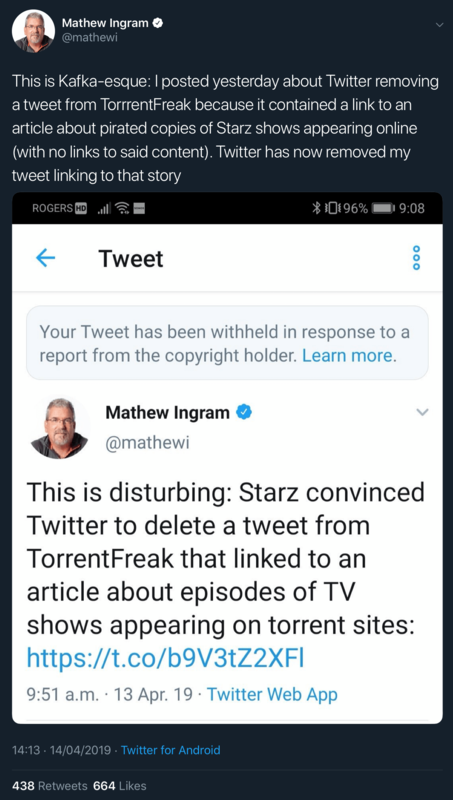 Now Starz is using more false copyright claims to try and get tweets linking to TorrentFreak’s response article removed from Twitter. The original article from TorrentFreak reported on some major leaks of unreleased TV shows including the Starz original “American Gods.” It used a single frame from one of the leaked episodes and reported that these episodes were being shared on pirate sites but it did not name or link to any of these pirate sites. According to TorrentFreak and Kit Walsh, a Senior Staff Attorney at the EFF (Electronic Frontier Foundation), Starz had no grounds for taking this tweet down because the article it linked to was simply reporting on the situation and not infringing on Starz’s copyright. However, even though the reporting is perfectly legal, it’s unfavorable to Starz and it seems like the TV network has used a bogus copyright claim to attempt to stop awareness of these leaked episodes spreading. As you’d expect, TorrentFreak wanted to bring awareness to Starz’s abuse of copyright law and so published an article explaining the situation and exposing Starz for filing this bogus claim. This article started to get a lot of attention on Twitter, meaning that Starz's attempt to squash the story inadvertently ended up with it being amplified further. 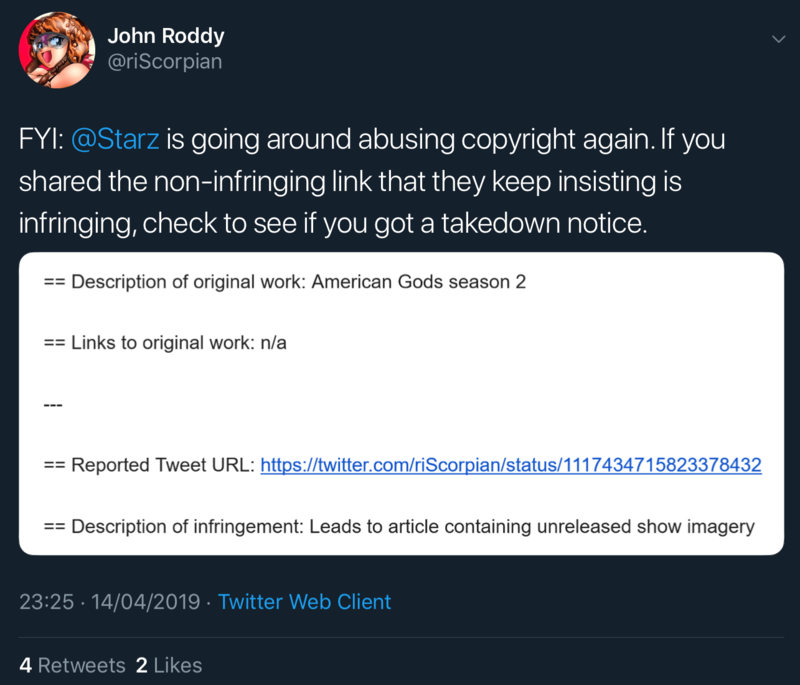 Instead of apologizing and retracting the original fake copyright claim, Starz doubled down and started to file more false claims against tweets that linked to this second article from TorrentFreak. 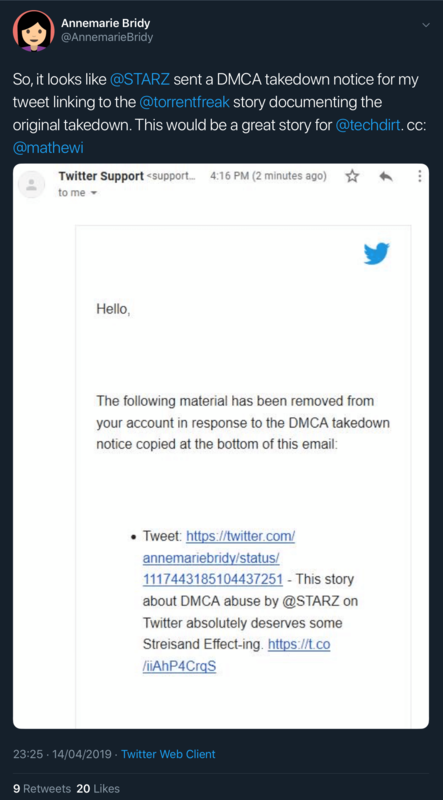 And instead of targeting TorrentFreak’s tweets, Starz has been filing multiple fake copyright claims against Twitter users who have linked to this second article. This is one of the many examples we’ve seen of copyright holders abusing the system to get unfavorable coverage taken down. False copyright claims and fake claims are also often used to censor videos on YouTube.